*edit the general aspects of a user - by clicking the pen symbol. 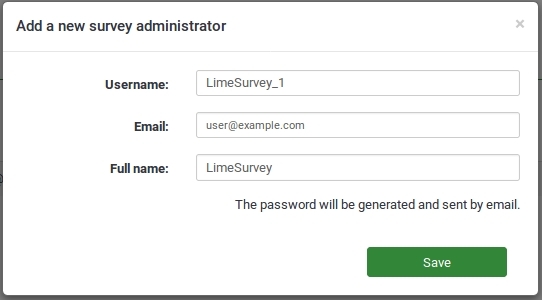 *delete the user from the survey administrators database - by clicking the trash button. *set global permissions for a user - click the lock symbol. *set template permissions for a user - click the pen-and-lock symbol. To delete a user account, simply click on his or her corresponding trash button (located on the same line with the user account you want to delete) and click '''OK'''. To delete a user account, simply click on his or her corresponding wastebin button (located on the same line as the user account you want to delete) and click '''OK'''.